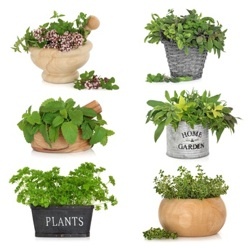 Growing Herbs in Containers is a great way of having a constant supply of chemical free herbs. 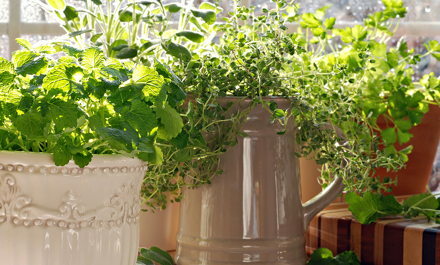 Find fantastic tips for growing fresh herbs on your patio, windowsill or anywhere. Get Fresh - Start a Container Herb Garden. Herb growing is easy and fun. There is no better way to improve the flavor of home cooking than with fresh herbs and they're easy to grow in a container almost anywhere indoors or out. Once you've started using herbs grown in your container garden, you will never buy the tasteless varieties found at the grocery store again. Create a garden of fresh herbs and keep it handy. 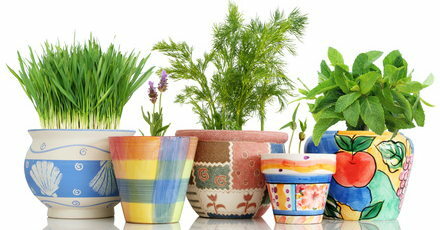 We like to place a big herb pot near a door or window to catch their aromatic scent when a breeze puffs up. Plant herbs with similar needs in the same pot for visual variety and a super tasty bouquet. Most herbs used for cooking are from the Mediterranean. These herbs like a slightly dry soil and high humidity. Because they do best in a Mediterranean climate they require a lot of sun and humidity. Plant your herb container garden in a container that will comfortably hold the plants you choose when they are fully mature. Line the pot with a small layer of gravel to insure good drainage. Fill the pot 2/3 of the way up with a sterile potting mix. Use potting soils without added fertilizer. Arrange your herbs in the pot. Plant the tallest herbs toward the middle of the container (or the back if the container will be against a wall). Fill the pot to just below the rim and water well until water comes out of the drainage hole. Add more soil if necessary; the roots should be completely covered with soil. Place in a sunny location either indoors or outdoors. To keep humidity levels high, put the herb container in a shallow tray or dish that is filled with gravel. Fill this dish with water. It will create a humid microclimate for your herbs. Herbs grow well in containers. Some herbs should only be grown in containers as they become quite unruly in the garden. Anything in the mint family should be grown in containers. There are a huge variety of different mints. Lemon balm is also included in this family. These plants are annuals, but they reseed easily. Simply plant one or two in a medium size container and water occasionally. Trim the leaves back to encourage bushy growth. Use the trimmings in drinks, teas, jellies, and cooking. Thyme, oregano, and basil do very well when grown in containers. Keep these herbs close to the kitchen door to enjoy their fragrance. Snip a few leaves and add to salads, main dishes, and vegetables. No herb garden is complete without parsley, choose curly or leafy varieties to add to your herb containers. Rosemary is a perennial shrub and can grow to a considerable size (3 feet tall and 3 feet wide). Keep it well trimmed and it will be happy in a container. Cut entire branches off the rosemary and use them for skewers. Lemon grass is a wonderful herb to grow in containers. Use this herb in Thai cooking. 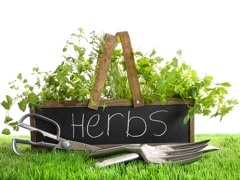 Experiment with herbs to see what you like and which grow well for you. One of the great things about container gardening is its versatility. Containers can be easily moved around to produce visually appealing displays and to take advantage of growing conditions. Another reason for moving containers around is to mimic companion planting. Companion planting is used in square foot gardening and in raised bed gardening. The idea behind companion planting is to deter pests and improve yields by companioning your plants with others that offer protection or support. Any vegetable and pot marigolds. Companion planting works because the smell of one plant confuses the common insect pests of the other. Flea beetles commonly plague greens such as lettuce. Planting lemon balm in with the greens gives off a lemon balm smell and flea beetles ignore the greens. This is a technique often used in organic vegetable gardening. Growing herbs in containers will allow you to add a variety of new tastes to your cooking. Herbs are attractive and fragrant as well as tasty. There is nothing like coming in from a dreary day and finding fresh, fragrant, herbs to greet you. Snip a few to add to your meal as you walk in the door. Visitors to our Growing Herbs in Containers page may also be interested in the following pages.